Does Iowa Wrestling have a Cael Sanderson Problem? The wrestling dynasty at Penn State should look familiar to Hawkeye fans. I remember sitting in the seats of the Qwest Center (now the CenturyLink Center) in Omaha in 2010, watching as the Iowa wrestling team gathered on the mat at the conclusion of the 2010 NCAA Wrestling Tournament to take a team photo commemorating the national title the Hawkeyes had just won. It was the third consecutive national title won by the Hawkeyes at the time and the 23rd in program history. That’s 23 national championships in one sport between 1975 and 2010. But there hasn’t been one since. On the surface, for nearly any other collegiate sports program outside of Storrs, Connecticut, and Tuscaloosa, Alabama, a seven-year drought without a national championship is not cause for concern. For Iowa wrestling, however, it’s beginning to become an increasingly larger elephant in the room. Cael Sanderson had just finished his first season as the head wrestling coach at Penn State. He didn’t have his own recruits yet, and he had just come from Iowa State – his alma mater – where he had moderate success as a collegiate coach. Now, however, the seeds were planted. The biggest star in the modern history of the world’s oldest sport had just planted his flag on the campus of the premier school in the state with the most sought-after high-profile wrestling recruits. That last sentence should look like Deja-vu for those of you familiar with the history of Iowa wrestling. 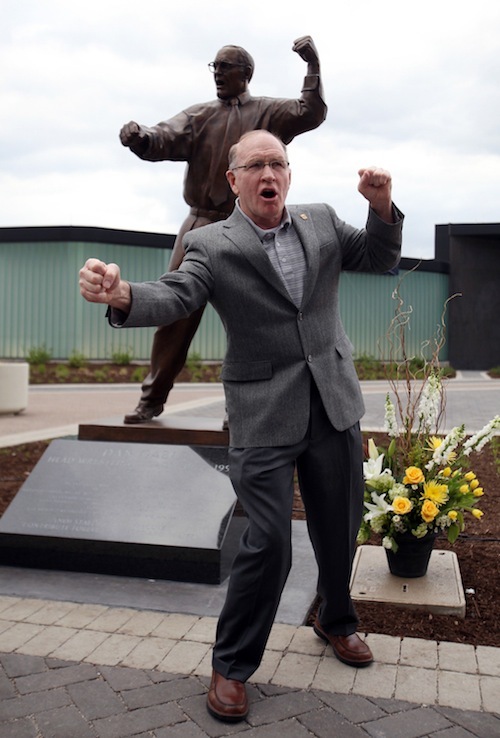 It’s a lot like the scenario that played out when Dan Gable took over in Iowa City in 1976. Gable was, at the time, wrestling’s biggest star, and he was taking over the program that had just won the last two national titles. There was no building an empire. Gable was the empire, and the top wrestlers from around the country flocked to him, in a small college town in the middle of a state full of corn. That’s the scary part. At Penn State, Sanderson has the same power and attraction Gable once had, but in a state where he could dominate the sport simply by locking down his borders. Consider this: Of the 320 wrestlers who competed at the 2015 NCAA Tournament, 48 of them hailed from the Keystone State. Don’t pull out your calculator, I got this -- that’s 15 percent. And that’s pretty good. Additionally, since Sanderson took over at Penn State in 2010 through 2016, the state of Pennsylvania produced 87 NCAA Division 1 All-Americans. Nineteen of them walked to the podium in Penn State warm-ups. Seven of those were national champions. In 2017, Sanderson led the Nittany Lion program to its sixth title in seven years and added five individual champions to the list. During the lone season in that stretch where they failed to take the crown – 2015 – Sanderson redshirted two of his best wrestlers in the middle of their careers. Basically, outside of UCONN women’s hoops, Penn State wrestling is the most dominant collegiate sports program in the country – just like Iowa used to be. Also like women’s hoops is the fact that there are only a handful of schools every year with a shot at winning the title in wrestling. Yes, Iowa is still in that conversation, but only on a rotational, off-hand basis with the likes of Ohio State and Oklahoma State. When Penn State doesn’t win, it’s still an upset. Honestly, as long as Cael Sanderson is at Penn State, I don’t see this trend changing. His status, his location and now his ever-improving résumé allow him to essentially have pick of the litter in recruiting – both nationally and in his own talent-heavy state. Like Gable, Sanderson doesn’t need to do much to sell himself or his program to kids. It’s all right there, fresh in their minds, as the only real empire they know. In the meantime, with every year that passes without Iowa on top of the wrestling mountain, Hawkeye coach Tom Brands must rely less and less on the empire and legacy that Gable built and more on his salesmanship. Those 23 trophies in the case are a thing of beauty and a definite source of pride for Hawkeye Nation. But their recruiting power decreases with every day that passes and every title that Sanderson wins. What you don’t want to do is start a revolving door of coaches like you might see in football or basketball, in order to get back to where you need to be. That would be silly, as Tom Brands is still one of the elite coaches in the sport and Iowa is still an elite program. So what can be done? Honestly, not much, outside of a change in mindset. Hawkeye wrestling was once the standard in the sport. That’s simply not the case anymore, and Cael Sanderson is why. That won’t change at least until he’s gone, and that day isn’t coming anytime soon. The answer for Iowa wrestling and its supporters is to keep grinding, yet stay content to a certain degree with the current state of affairs of the program. Iowa is still a contender and a threat to win the national championship every year. Given the empire that has been built in Happy Valley, that’s as good as its going to get for now. Does Iowa have a Sanderson problem? Absolutely. But so does everyone else. The road to the Summer Olympics for the country’s wrestlers will again go through Iowa City. USA Wrestling announced Wednesday via social media that the 2016 U.S. Olympic Team Trials will be held at Carver-Hawkeye Arena on April 8-10. The event returns after being held at CHA in 2012. The announcement was a chance for fans and members of the local community to circle the date on their calendars. The date had to be finalized so the national team could be determined in relation to the international wrestling schedule. The 2012 Trials smashed USA Wrestling attendance records for the event, totaling more than 50,000 total spectators over four sessions of the two-day event. A group of local wrestling leaders and event producers flew to Colorado Springs, Colo., to pitch for the 2012 Trials, contending with other sites. This time their previous results provided all the persuasion they needed. The state’s support of the sport and long history of success makes a perfect marriage with the event. ICCACVB President Josh Schamberger said he was relieved of the official announcement. Bringing the nation’s top amateur wrestling event back to Iowa City was a top priority for him. Schamberger said the local group, that included legendary wrestler and coach Dan Gable, Iowa head coach and Olympic champion Tom Brands, Cornell Coach Mike Duroe and UI’s Les Steenlage, had a vision to create a lasting home for the event here. They did enough to earn another turn. The event made a big economic impact, generating $5.6 million for local communities. It wasn’t contained to the Iowa City and Coralville area. Schamberger said some fans stayed as far away as Cedar Rapids during the event. The Olympic Trials will be the exclamation mark on a banner year in 2016 for Eastern Iowa wrestling. Iowa also will host the Big Ten Championships and Cedar Rapids will host the NCAA Division III Wrestling Championships in March. AMES " Iowa State wrestling coach Kevin Jackson sat down and spoke. Mike Moreno, his sophomore 165-pounder, listened. Not anymore, thanks largely to the mettle-testing journey. Moreno stands 17-5 entering Saturday's Big 12 dual at West Virginia. He cut weight to wrestle at 157 pounds last season and got hurt early, quashing hopes of competing in confidence-boosting open tournaments and the prestigious Midlands Championships. Moreno ended up 4-13, while yielding bonus points in eight of those losses. Not that they were easy to absorb for the former state champion from Urbandale. Moreno " whose brother, Gabe, is a redshirt freshman at ISU " stands as one of several Cyclone wrestlers on the rise after enduring rebuilding mode last season. "If I just follow his lead, I know great things will come for me," Gabe said. The team-wide growth began accelerating on the heels of a gut-wrenching 32-3 loss Dec. 1 at arch-rival Iowa. The Cyclones (4-3, 0-1) have won three straight dual meets. Moreno is one of five top-20 wrestlers in the lineup " and also one of seven freshman or sophomores slated to start in Morgantown. "We're definitely clicking more as a team," said ISU's Kyven Gadson, a sophomore and fellow legacy wrestler tabbed No. 11 by Intermat at 197. No one's clicking more " in terms of a reversal of fortune " than Moreno, whose dad was coaching Gabe to a state 3A title at 145 pounds last season. All of Moreno's losses this season have come against ranked foes. Four of the five were lost be a total of seven points and two ended in overtime. Clearly, a different "different place" is now in sight. "His expectation is to be an all-American before his dad was," Jackson said. It's how dad wants it to be. Captain America plans to return, to Iowa City. Creston-Orient-Macksburg three-time state champion, wrestler Jake Marlin, received the, nickname last year as some Panther teammates referred to each other by, superhero characters. University of Iowa will benefit from his talents in the future. Marlin confirmed that he orally committed Sunday to wrestle next year for the Hawkeyes and head coach Tom Brands, following an official visit to the campus last weekend. Iowa wasn't at the forefront of his list as Marlin was considering the University of Nebraska and University of Wisconsin. He was won over during his trip that began Friday and concluded Sunday. Marlin said his style meshes well with the team and coaching staff. He is a really good, too. According to Creston Coach Darrell Frain, Marlin owns a 148-5 record. Marlin has won Class 2A individual titles at 130, 135 and 138 pounds for the Panthers. He expects to compete at 138 again this season, attempting to become the 22nd four-time state champion in Iowa history. Marlin said he will wrestle 141 pounds with a possibility of growing into the 149 weight class. He has big aspirations, and considers the Hawkeye wrestling room the place to achieve them. Frain said he thinks Iowa is a perfect for the Marlin. He said former Hawkeye Mario Galanakis has been on the Panthers staff, guiding Marlin. Frain said he has witnessed Marlin's ability to zone in on a feat and never, slow down, until it is accomplished. According to Amateur Wrestling News, Marlin was a double All-American at Fargo, N.D., in 2010, placing fourth in freestyle and seventh in Greco-Roman. He said his performance this summer her his stock, dropping him from national rankings, but he is fueled to prove doubters wrong. According to AWN, Marlin is the second prep to commit to the Hawkeyes, joining Broc Berge, a projected 197-pounder from Kasson-Mantorville, Minn. When it boiled down to it, Broc Berge had to follow his heart. It's unfortunate for University of Minnesota wrestling fans, but Berge's heart decided his best option was to leave his home state. After a long recruiting battle and many sleepless nights, the Kasson-Mantorville senior standout gave his verbal commitment this week to wrestle for the University of Iowa. Berge was considered the nation's No. 1 recruit at 195 pounds by several publications. He's ranked the No. 11 overall recruit in the country by Amateur Wrestling News. With Simley's Jake Short already committed to Minnesota, Berge was the state's top remaining prospect. The Mantorville native is a two-time state champion, and a 2012 USA Junior National Freestyle runner-up. Berge was perfect last season, going 48-0 with 28 pins on his way to the Class AA state title at 195. He went 40-1 as a sophomore and won the state crown at 189. As a freshman, Berge placed fourth at 189. About a month ago, Berge said he narrowed his college list to Minnesota and Iowa. Wisconsin and North Dakota State had offered Berge full-ride scholarships, but he said it never was about the money. Berge visited both Iowa and Minnesota recently. The visit to Iowa went well, Berge said. Berge said the recruiting process wore on him. He grew tired of the constant questions. Berge said it got to the point that after school he would go to football practice " he's also one of the area's top running backs " then go straight home every day, simply to avoid the questions. "It was stressful. It wasn't bad stress, but it was still stressful," Berge said. Wrestling practice begins in a few weeks, and Berge said he wanted to make his decision immediately so he could focus on the KoMets' goal of winning a state team title. Still, the decision was far from easy. Berge said he did feel allegiance to his home state. He said he felt pressure from Minnesota fans, but everything that happened in the recruiting process pointed Berge toward Iowa. It helped that Terry and Tom Brands made it clear how badly they wanted Berge to be a Hawkeye. Berge said he felt that love right away from the Hawkeyes. "It came down to me feeling that Iowa was the best place to shape me, not just as a wrestler, but as a person," Berge said. STATE COLLEGE, Pa. " Cael Sanderson accomplished just about every notable achievement during his illustrious career as an amateur wrestler and collegiate coach. However, there's one notable exception. In nine tries as a wrestler and coach at Iowa State, and now the coach of Penn State, Sanderson has never defeated Iowa in a dual meet. "Is that true? Is that right? " Sanderson deadpanned this week during practice. Sanderson's next chance comes Sunday when the second-ranked Hawkeyes visit the No. 3 Nittany Lions at Rec Hall. Penn State, the defending NCAA champion, is 3-0 in its last three dual meets, all against Big Ten foes on the road. The Nittany Lions won 28 of 30 individual bouts and outscored their opponents 117-9. According to InterMat's latest individual rankings, eight Penn State wrestlers are ranked among the top 12 at their respective weights, including four ranked either 1 or 2: No. 1 Molinaro (149), No. 1 David Taylor (165), No. 2 Ed Ruth (174), No. 2 Quentin Wright (184), No. 6 Cameron Wade (285), No. 8 Nico Megaludis (125), No. 8 Dylan Alton (157) and No. 12 Morgan McIntosh (197). Iowa counters with six ranked wrestlers: No. 2 Matt McDonough (125), No. 2 Tony Ramos (133), No. 3 Montell Marion (141), No. 6 Mike Evans (165), No. 9 Ethen Lofthouse and No. 12 Bobby Telford (285). Despite the edge in ranked wrestlers, the match figures to be close. Even if the Hawkeyes repeat the 22-13 win they posted a year ago, the Nittany Lions said they won't let it derail their goal of repeating as Big Ten and national champions. Wrestling isn't just part of Adam Pavlenko's life. It's ingrained in who he is. It's what his family does, from his dad to his brother to him. Some of his earliest memories are from when he started wrestling at age four. "Wrestling is big for us," Pavlenko said. Pavlenko, an accomplished amateur wrestler out of Marcos De Niza (Ariz.) High School, believes his wrestling background will help him as an Iowa State linebacker. Pavlenko, a 2012 recruit, verbally committed to the Cyclones over the weekend. "Wrestling makes you mentally tough," Pavlenko said. "There can be a big grind in football, and you pull out of it because you've been through hell because wrestling is that hard. ISU has now landed two accomplished wrestling linebackers in the last month. Kane Seeley, from Perry, committed in mid-July. He went 47-0 last season and won the Class 2A state title at 215 pounds. He said the physicality of wrestling helps on the football field, and moves like double leg takedowns help with tackling and hand contact. It also helps with conditioning. He recorded 133 tackles last season and is a Rivals.com three-star prospect. Pavlenko said he would consider wrestling at ISU, but added he wants to concentrate on football. "Maybe in the offseason I would go in two or three times a week and stay in shape, but that all depends on the coaches" Pavlenko said. At a minimum, he would like to wrestle Seeley at some point in the offseason. Iowa State University Sports Information Director Tom Kroeschell confirmed that wrestler Trent Weatherman has been suspended indefinitely from the Cyclones team after violating team rules. Weatherman was arrested for the second time in three months early Saturday morning. According to the online arrest report for the City of Ames Police Department, Weatherman, 21, from Huxley, was arrested for simple assault at 2 a.m. July 2. The arrest is his second since being arrested in April for public intoxication with a 0.23 blood-alcohol level. Kroeschell told SourceMedia Group News that Cyclones Coach Kevin Jackson was out of town and unavailable for comment. Mark Palmer of College Wrestling Examiner reported the suspension earlier Wednesday, citing other media sources. Weatherman went 15-15 at 157 pounds as a red-shirt freshman for the Cyclones last season. He placed fourth at the Big 12 Conference tournament. Weatherman was a four-time state finalist for Ballard High School, winning the Class 2A 152-pound title as a junior and senior in 2008 and 2009. He compiled a 180-8 record as a prep, earning high school All-America honors from Amateur Wrestling News.